Doesn’t it drive you crazy when the songs, guitar solos or exercises you play on your guitar sound good on one day, but sound like total crap the next day? We’ve all had this problem. It’s super frustrating when you can’t rely on your guitar skills to be consistent and dependable in every situation. It gets even worse when you really need to play your best (such as when other people are watching you play, or when you want to record your playing, or when you're jamming with other musicians)... It's always in those important moments that you are most likely to fail. Fortunately, it’s simple to solve this problem by training the CONSISTENCY of your guitar playing. There are little-known, but proven effective guitar practice strategies you can use to close the gap between how well you can play on your best days and how poorly you play on your worst days so you can finally play your best when it matters most. Stop making embarrassing mistakes in your guitar playing and develop the critical consistency you need to make your guitar playing sound its best EVERY TIME you play and in all situations, like a machine. Are able to consistently perform your music in front of others, in any condition or environment, without falling apart. No longer feel nervous about sometimes sucking when you play guitar. Start having a lot more fun playing music instead of worrying about making mistakes. 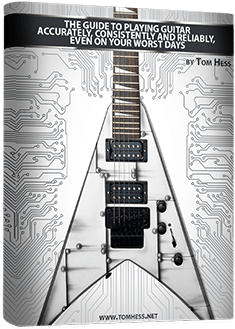 Get INSTANT FREE access to "The Guide To Playing Guitar Accurately, Consistently And Reliably, Even On Your Worst Days" now. Simply enter your name and email, then click the 'Give Me Access Now' button to enter. All information is kept 100% private and confidential.